The photo is of the prize giving of the 1st BBC National Golf Competition, which was held at Kings Norton Golf Course in Birmingham. 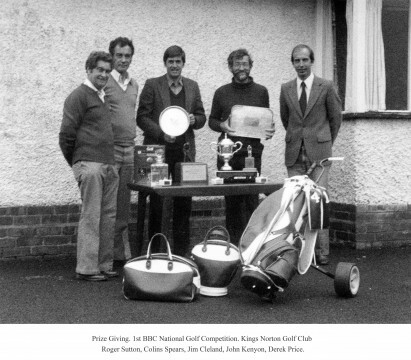 There seem to be a lot of trophies for the Pebble Mill contingent! The photo features (left to right): Derek Price, John Kenyon (Farming editor), Jim Cleland, Colin Spears, Roger Sutton (vision mixer). Please add a comment if you know the approximate year of the photo, more about either the competition or the various participants.